Even though I try to keep it neat there is a lot of crap on my desk. 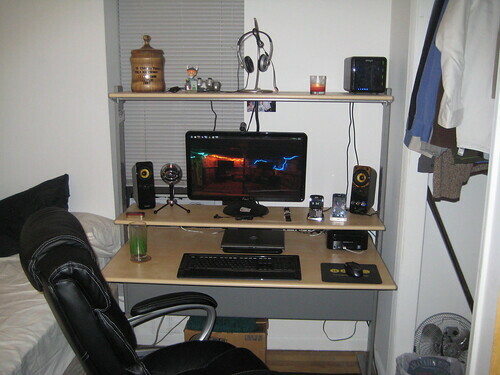 The Zino HD on the bottom right is my main PC. The Drobo (top right) is connected to it, along with the webcam, microphone, iPod dock, and speakers. The monitor is actually hooked up to the PC and the docked laptop. My work laptop (not pictured) is a Dell, too, so the dock is really handing for switching back and forth between laptops. I use the Logitech headphones on the banana hanger, and the Blue Snowball mic for recording the podcast. I am also learning to play the harmonica, and plan to record myself doing that, too. Not to publish – hearing a recording of myself playing will allow me to concentrate on what I am hearing, without also concentrating on playing. Under the desk, you can see my Old Milwaukee Light case with a pillow on top of it. In addition to holding all my spare parts and cables, I use it as a foot rest. Behind the monitor is a lamp that is clipped to the top shelf. It does a pretty good job of backlighting – to spare my eyes, when I want to use the computer in the dark. The keyboard/mouse is a Best Buy-brand combo. I really like them both. So much so, that I bought a second set to take to work. Work provided me with the Blackberry, so I canceled the service on my iPhone, and just use it as an iPod now. Those are both docked as well. I really like docks, apparently. It makes it way easier than dealing with loose cables laying around. The iPhone dock is plugged into the Creative Gigaworks speakers directly, so I can listen to music mid-reboot. I prefer using it for Pandora, too. Cable management is still a bit of an issue, but the desk has a space built into it for cramming wires, and that is good enough for me, for now. The actual desk is an Ikea Fredrik. That is probably way more detail than anyone really wants, so I will leave it at that. I may end up posting my work desk, too. Look for that later.